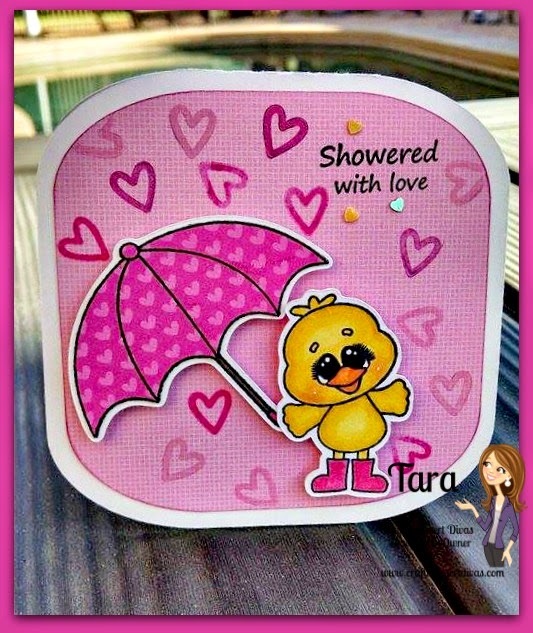 Welcome back to day 2 of the CDD April Stamp Release Blog Hop. All stamps are in the CDD Shop and now available for purchase. For my first project I've created 2 mini notecards. I thought I would put them in my girls lunch box a day next week to let them know how much I love them. 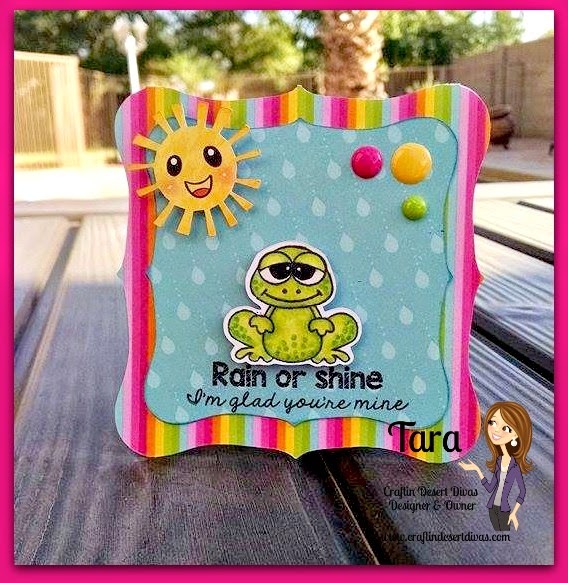 I've used the new stamp set Rain or Shine. I just love this adorable duck and frog. My papers are from Doodlebug Designs. I've paper pieced the top of the umbrella. The stamped hearts are from the Totally Turtle stamp set. I also added a few of the CDD True Love sequins around the sentiment. The duck boots and umbrella handle are colored in with my Wink of Stella markers. He is such a cute frog. I can't tell you enough how easy these images are to color in. I've also added a face to the sun from the Totally Turtle stamps. My second project is using the new Just Bugcause stamp & die set. I found this flower shape in the Silhouette Store and cut it out. I then used CDD Fuchsia Kiss & Lucky Sequins. I glued them down to color in the flower. It took a little time but I really like the sparkle of the sequins. To finish it up I added a button and used my Fiskar grass punch. I hope you have enjoyed this release and thank you SO much for joining us. 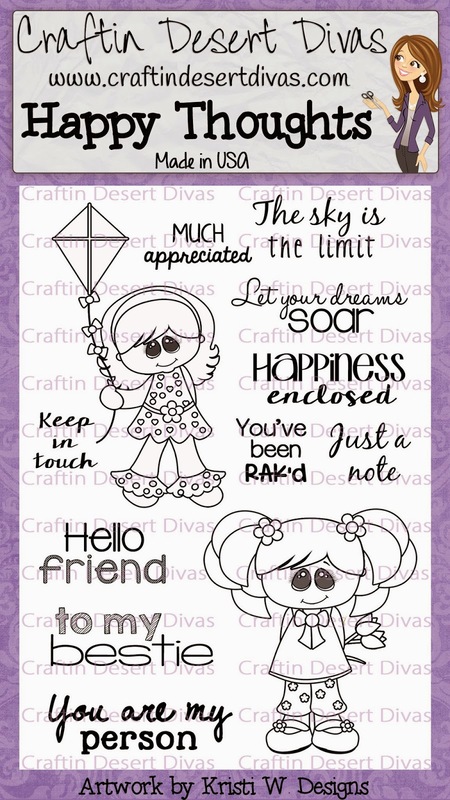 You must email craftindesertdivas@gmail.com to get this freebie. It will be only available today. You must comment and follow all blogs in the lineup to qualify for the freebie. Love all of your projects. Cute, cute! Thank you for sharing. Have a nice crafty day! Good job ladies, beautiful projects! 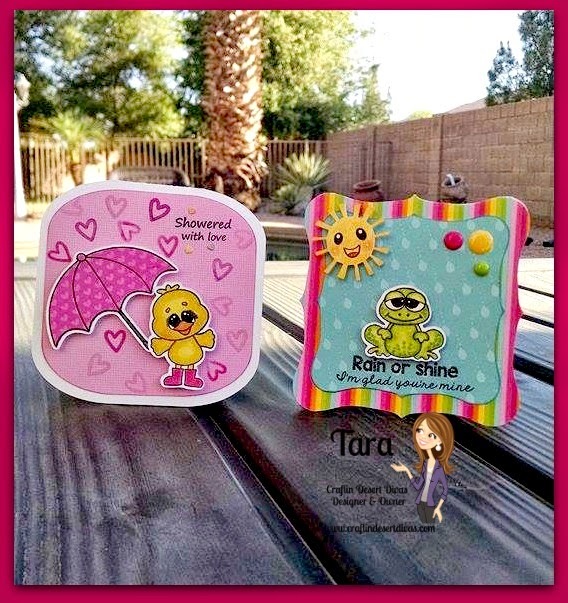 Your cards are so cute and adorable! 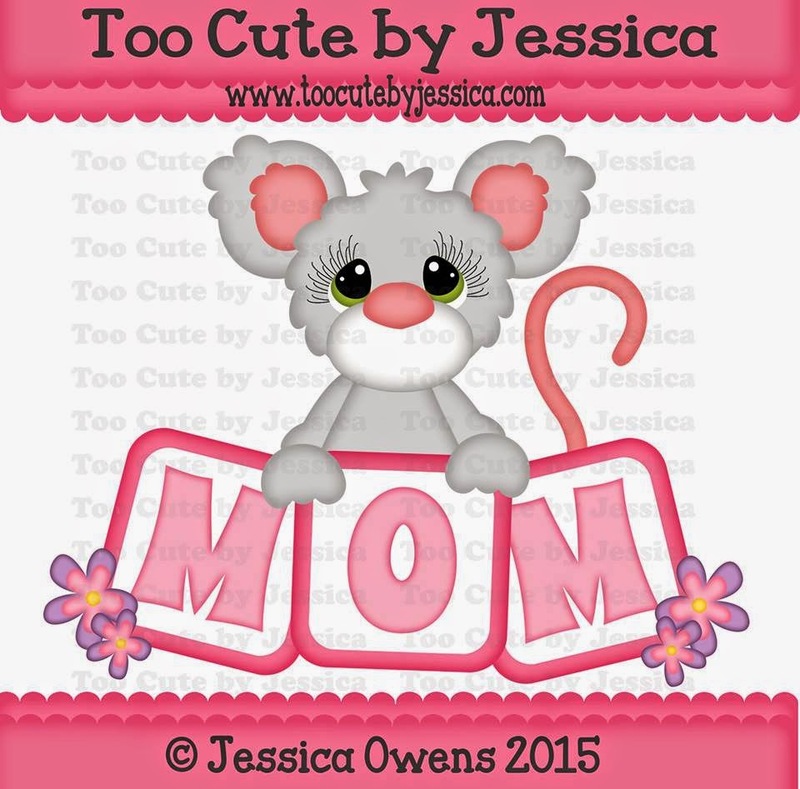 I can't wait to get my set and make some adorable cards! Super cute note cards. Love them all. TFS. Love the new stamps! Thank you for sharing!! I LOVE THEM!!!!!!! The flower with the sequins is delicious and the note cards are adorable!!! Love your cards. They are great. Great cards. The sequins are awesome. Your girls will love getting these. Oh my goodness... your note cards are just too cute, and I LOVE how you used the sequins on your flower card!! Your projects are always fabulous!! 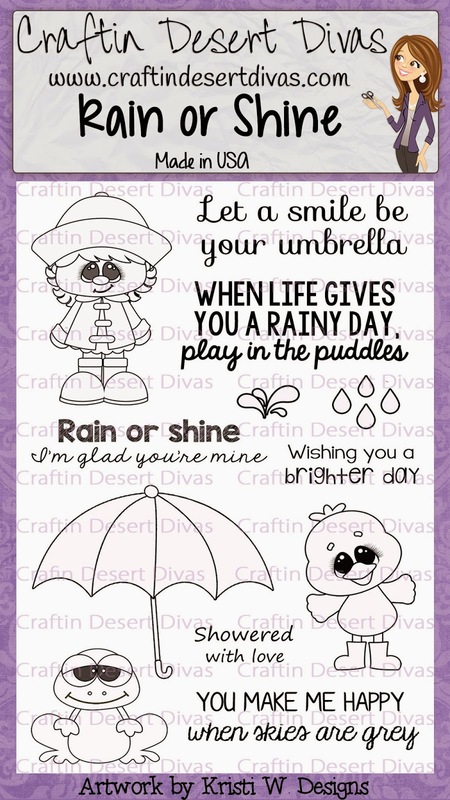 Very Cute, I love Doodlebug papers. Thanks for the great ideas. I wrote a message from my phone, but don't see it here. Your daughters are going to have BIG smiles on their faces when they open their lunchboxes!!! Love the duck and the frog. Your Flower card is amazing. 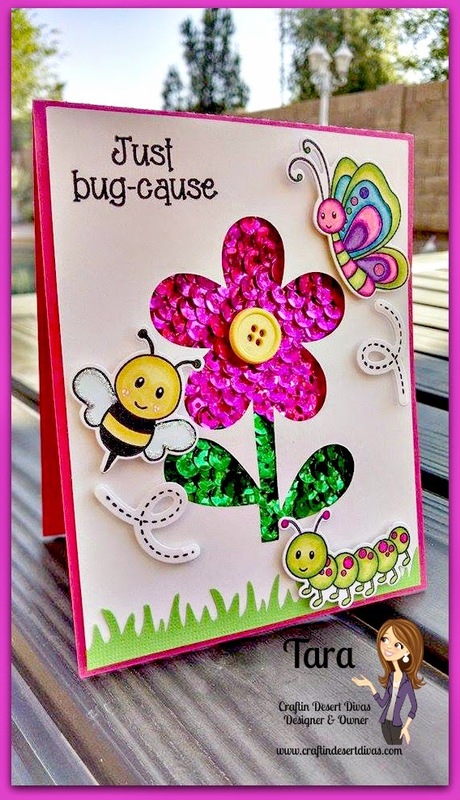 Love the little bugs and the sequins to highlight the flower. I bet it did take a very long time to place each one. It has been a fun week - thank you!! I love them all!!!! The flower is so amazing!!! Great cards! The sequin flower is fantastic. Still loving all the new images! Very creative with the flower love them all. Oh wow! You did a ton of the hop! Such super cute and fun projects! Love them all! Can't wait to take this inspiration and make some cards! The froggy & duckling cards are just to dang cute, but the bee card is drop jaw gorgeous. I love the sequins & can't believe you glues each one down one by one, wow what a task that must have been. The design of the card is outstanding & the coloring is spectacular. Love both project, the flower card with the sequins is my favorite. Wow what super cute cards!! Thank you for sharing! Love that flower!! I didn't buy this set yesterday, but I think it will be on a future purchase. Both cards were great. The projects are all adorable! Thank you for a great hop! So adorable! I love the bugs! 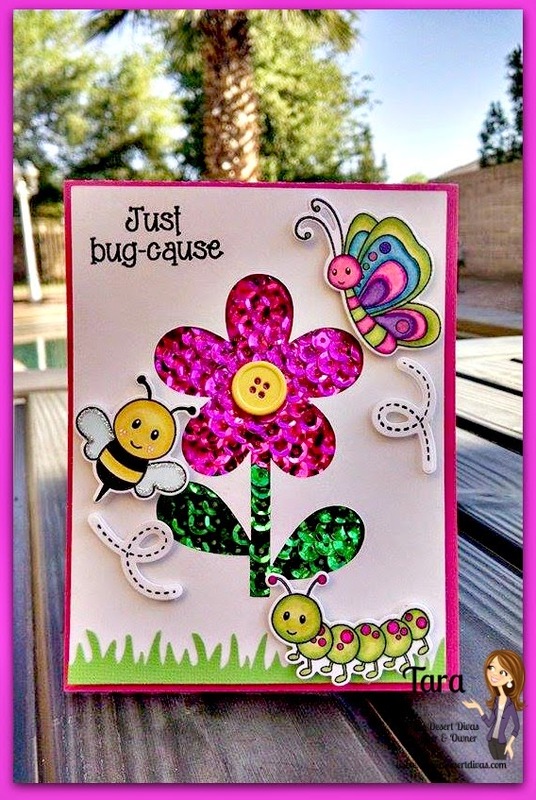 I just love the little bug cards! Those are all such awesome cards. Love all of your cards! 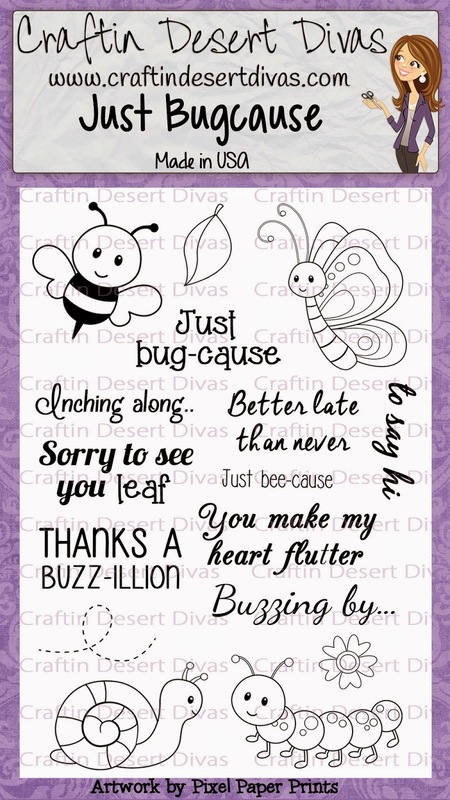 Especially love the Just Bugcause stamps! Can't wait to receive mine. Super cute!! I really think that frog is ADORABLE!! And the sequin card is fabulous!! I image that it took forever, but it was worth it! I like more the flower card because of the sparkle and the little bugs, I love them. Love your cards. So Cute! Adorable duck! Love the sequin flower as well. Fabulous job! So many cute new products and lots of inspiration. Thanks! These are all so fun! Love the sun and the rainbow paper. I bet those sequins took forever, they look great though! So so so happy I ordered my Just Bug-Cause stamps!! Cannot wait to use them!! Your cards are so cute. Love what you did with the sequins! ! I love the little caterpillar! !